The hike requires a rather high level of fitness, as you have to ascend about 2000 MASL. One small stretch with an easy via ferrata is technically demanding. Sights worth seeing include the stream of Zli potok, the viewpoint Tise, the natural arch Hajdučka Vrata, Lake Crvenjak and Veliki Vilinac peak. Climbing Mt Čvrsnica from Diva Grabovica is a two-day walk. You can spend the night at the Vilinac mountain lodge. You set out from Diva Grabovica via Zli potok, where the trail goes mostly through forest. Along that stretch of the trail, from the starting point to the house at Tise, there are two streams where you can replenish your water supply. An excellent break area is the Žiško bivouac. Zli potok is around 50 metres above. This is where the ferrata starts, and with it, a serious climb. From the stream Diva Grabovice you continue towards Tise. When you arrive at Tise, high above in the distance you will see Hajdučka Vrata. That part of the track is called Strmenica (Steepslope) for good reason, and most of it is exposed to the sun. When you reach Hajdučkih Vrata, the road continues by lake Crvenjak to the Vilinac mountain lodge. This is the end of the first day. On the second day, continue to the peak Veliki Vilinac, just 40 minutes from the lodge. The view from the top defies description. Once you've reached the peak, you have three options. The first is to take the longest trail all the way across Mt Čvrsnica to the peak Pločno, then descend to Masna luka. This route is very difficult in summer heat. The second option is the shortest trail, via Mali Vilinac to the ski resort. The trail is badly marked, so the walk continues with a descent to Muharnica via Vitlenica. Although this route is well marked, at the end you have to traverse 6 long kilometres of asphalt. After you master 2400 metres of altitude difference and over 30 km of trail, the walk ends at the motel "Hajdučke vrleti." Must see: the stream of Zli potok, the viewpoint Tise, the natural arch Hajdučka Vrata, Lake Crvenjak and Veliki Vilinac peak. The walk is demanding technically and in terms of fitness requirements. When climbing up the via ferrata the use of protective gear is mandatory: helmet, harness and ferrata set (or a Prusik with two carabiners). No risk of landmines. Helmet, harness and ferrata set (or a Prusik with two carabiners). Standard mountaineering equipment. Go west from the lay-by, down the marked trail running parallel with the road leading to the quarry. After the quarry turn left, go up the forest road to the bivouac "Žiško". 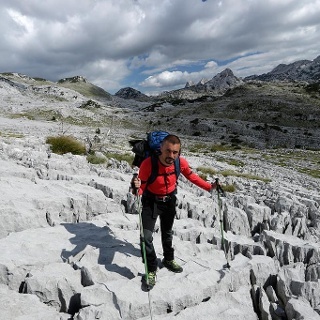 Above the bivouac there is a fork where one arm leads to the Veliki kuk ferrata, and you need to take the right arm leadig to the Zli potok ferrata. The cable is followed by a steep serpentine incline leading to the lodge at Tise. From Tise, pass above the old horse-stable and come down the avalanche path to the road leading to Strmenica via Žlijeb. 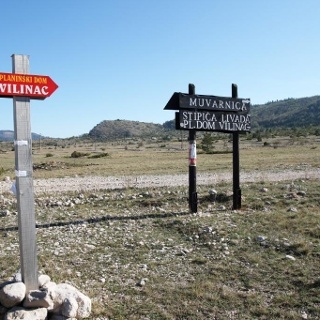 Go up the scree to the arch of Hajdučka Vrata, then west by lake Crvenjak to the lodge at Vilinac. From the lodge go west uphill to the peak Veliki Vilinac. From there, go back to the junction leading to Hajdučka Vrata and head north to Muharnica. Bus or train to Jablanica, then look for transport to Diva Grabovica. Take Exit West from Sarajevo, then M17 to Jablanica. Drive through Jablanica and continue towards Mostar. After the Begić and Begović bridge turn right across the Neretva River and take the macadam road to Diva Grabovica. At the end of the road there is a large lay-by (park there). Since the walk ends on the other side of Mt Čvrsnica (Muharnica) you have to find transport from Muharnica to Diva Grabovica. Park at the large lay-by at the end of the road to Diva Grabovica.